Spaghetti. With Shrimp. In just a few minutes. Okay, I used linguine. But you get the idea. When I was in my twenties in my first NY apartment (studio, 4 floor walk-up) I used to soothe myself from the barrage of NY (a barrage I loved) with sautéed shrimp and angel hair pasta mixed with butter. It sealed up the insanity and made me feel whole again. That was a long time ago (yet very crystal clear). But these days I don’t stray too far from that brand of comfort food. Still with the shrimp. Still with the pasta. But minus the butter (olive oil instead). And a couple of added goodies. First off, I cut the shrimp in half lengthwise it makes a nice shape when cooked and gives you more shrimp to the mouthful. Figure about 1 pound of shrimp to almost a pound of pasta (two-thirds?). Then I heat some olive oil in a large sauté pan. When hot I sauté the shrimp until opaque, then take them out. Now add some diced onion and minced garlic to the pan. Let them cook and soften (add some more olive oil if needed). Then add diced up fresh tomato and diced up lemon — including the peel…gives you a nice surprise bite of lemon. Let that sauté till hot. And making the breadcrumbs. I heat a little oil in a small sauté pan, add about a cup of panko crumbs, season with salt & pepper, and sauté until breadcrumbs brown to deep golden. Add the shrimp back to the pan w the onion-garlic-tomato-lemon mixture just as the pasta is almost done. Drain pasta, reserve some cooking liquid, add pasta to pan with shrimp. Toss to coat and to let pasta absorb some of the tasty juices. Add some pasta water if too dry and another drizzle of olive oil. Season to your liking with salt & pepper and a little hot pepper. Add a good dusting of breadcrumbs. I promise you the cares of your day will melt away. This is especially fun eating quietly while watching a favorite, also comforting, TV show. Not the news. A comforting TV show. That makes you giggle. Or draws you into the story and characters. An old movie is perfect. Preferable something from the 1930’s or 40′ or 50’s or early 60’s. See that? It can be easy to feel good. 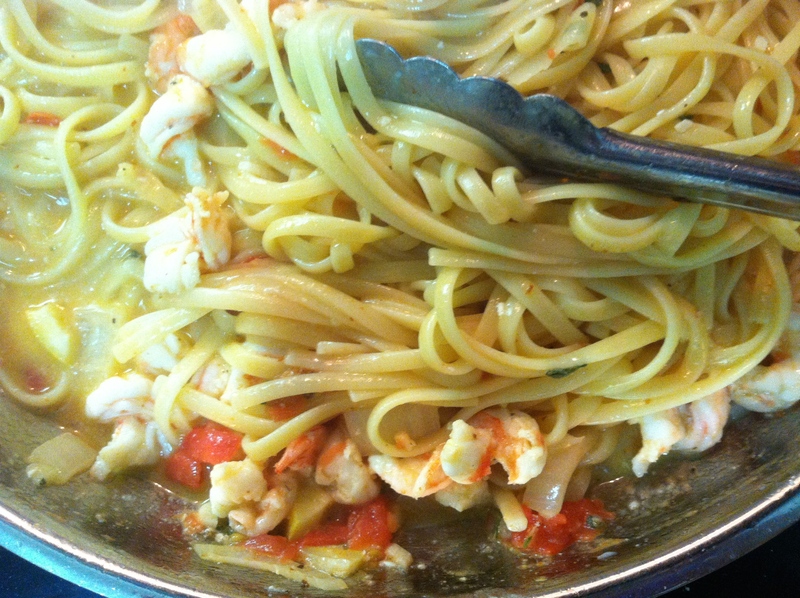 This entry was posted in recipes and tagged easy, Italian food, Italian recipes, lemon, linguine, recipes, seafood, Shrimp, Spaghetti. Bookmark the permalink. ← Quail Eggs. Too delightful…too delicate not to like. Oh Paulette this looks wonderful and oh so easy. Thank heavens you used boxed pasta…At first I thought I would have to get through that hurdle…making my own from scratch…which until I take a class or two from you I will never perfect. Thanks for another easy dinner idea. Thanks, Teresa…! Just made the same tonight…added some zucchini and peppers and mushrooms…with capellini this time. Still fun! Oh yes, can’t be making fresh pasta all the time 🙂 ! And, yes, we should do it together some time for sure.